"Pleasure is Nature's test, her sign of approval. When man is happy, he is in harmony with himself and his environment." Shambhala Bungalow Village is located on the west coast of Koh Phangan in the Southern Gulf of Thaïland. Nai Wok Bay (Ao Plaaylem) has become one of the islands most attractive beaches. Spectacular sunsets over famous Anthong National Marine Park will be your daily companions. The charming port town of Thong Sala with its famous food market is only a few minute bike ride away. All bungalows are set amongst the coconut trees on the beach and in our big lush garden overlooking the turqoise bay. Nai Wok Bay (Ao Plaaylaem), 2 km northwest of the main town Thong Sala, is easily reached by bike, taxi or a 15 minute walk from there. It's situated at the base of a granite mountain, Khao Hin Nok, which dominates the landscape with its huge round boulders. The area is famous for it's phantastic hillside views over Anthong National Marine Park. The unspoiled white sandy beach stretches between characteristic rocks at both ends. A preceding reef lies about 100 m off the beach and is providing perfect swimming conditions during the high tidal season (September to April). Over the reef you will find corals and a fairly vivid underwater life. Smell the taste of old Koh Phangan's simplicity – Pure nature, lovely cottages and charming beach restaurants to hang out. Paddle around giant boulders and enjoy snorkeling trips on your own. Koh Tae Nok means Bird Island and is the bigger of the two islands off Plaaylaem Beach. Nobody is aloud to set foot on it since the island is owned by a family company harvesting the swallow birds nests, a well known speciality consumed mostly in Asia. Pirate-like guards, armed with homemade rifles, oversee every movement of eventual boats entering their territorial waters and don't hesitate to fire warning shots from their bamboo huts hanging off the cliffs around the island. Ask for our morning boat trip to discover the Nai Wok and Tongsala area, including these islands, the mangrove river jungle, Tongsala harbour and with a unique pit stop for breakfast. Koh Phangan (or Ko Pha Ngan) is an island in the Gulf of Thailand in the province of Surat Thani in South East Thailand. It is 20 minutes in boat from sister island Koh Samui to the south, and 75 minutes from Koh Tao to the north. It is famous for its full moon party at Haad Rin Beach and as a backpackers destination. 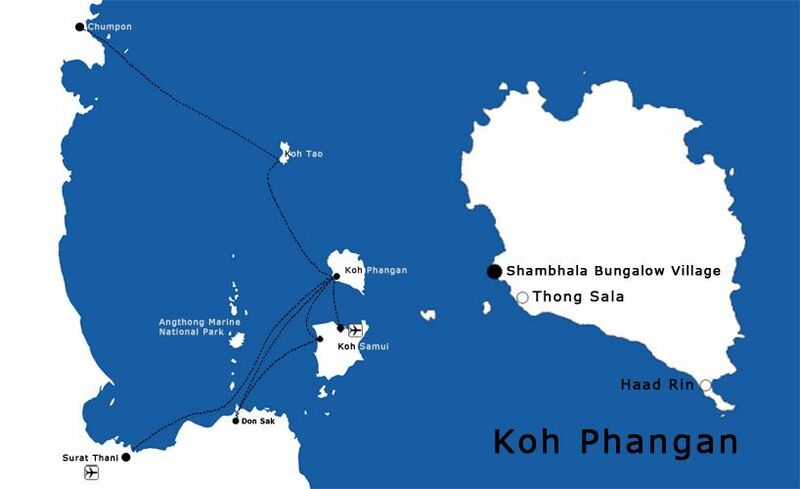 Click on this slide to locate Koh Phangan in Thailand and the Shambhala Bungalow Village on the island map. Koh Phangan is about 3 1/2 hours from Surat Thani Province and 30 minutes from Koh Samui Island by boat. 1. Book an hour flight from Bangkok Airways (call center 1771) or Thai Airlines (call center 02-256 1111) to Koh Samui and buy boat and bus ticket from the airport limousine counter to get to Koh Phangan. Book the flight at Airasia.com (call center 02-515 9999), 12Go Airlines (call center: 1126) and Thai Airways (call center 02-256 1111) which operate a one hour and ten minutes flights from Bangkok to Surat Thani province daily , buy a boat and bus ticket direct to Koh Phangan from the information counter in Surat Thani airport. Buy joint ticket (boat & bus) from any travel agent in Bangkok (especially on Kao San Road) direct to Koh Phangan. The bus leaves from Bangkok at 1800pm and you will be on Koh Phangan about noon time the next day. - Usually, the bus is available all the time, you do not need to book in advance. - Train is always fully booked on Weekend and Public Holiday, if you choose this transportation, please be awared to book at least 7 days in advance. Bangkok Airways (call center 1771) operates three flights a day from Phuket to Koh Samui daily. Flight schedules changes due to tourist seasons. The easiest way to get the joint ticket (boat & bus) direct to Koh Phangan is to contact any travel agency in Phuket. They all sell the ticket and arrange the journey for you. Bangkok Airways (call center 1771) operates flight leaving Singapore to Koh Samui daily. Airasia (call center: 02-515 9999) operated two flights daily to Phuket. Connect with Bangkok Airways, you will be on Koh Samui in the same day. Bangkok Airways (call center 1771) operates flight leaving Hongkong to Koh Samui daily. Please note that Travel on Peak Season (December-April) needs flight booking at least one months in advance. Languages spoken are Thai, English, French, German, Italian, the resort has multi-lingual staff. Local currency is the Thai Baht. All billings are made in Thai Bahts. Check-in is at 2pm and check-out is 12pm. Electricity is supplied at 220 volts. The plugs in the bungalows are adapted for all types. High-speed wifi Internet access is complimentary for all guests, a laptop with internet is available in the restaurant. Thailand is 6 hours ahead of Greenwich Mean Time (GMT) and doesn’t follow summer/winter time. Thailand's climate is tropical. High in both temperature and humidity and most people find it very pleasant. The average temperature in Thailand is about 30 degrees Celsius, or 86 degrees Fahrenheit. Due to its location, daily average temperatures in Koh Phangan range from 24°C to 32°C. You will probably experience «summer temperatures» here year round, but Thailand and Koh Phangan is normally divided into three seasons: the dry season, the hot season and the rainy season. In Koh Phangan, the rainy season is not in the summer months like the main part of the country but between october and november. The tides vary daily and between different seasons. All of Koh Phangan's West coast from Haad Rin to Chaloklam has a big offshore barrier reef and no open water bays. Shambhala's beach is part of that. The difference between high and low water level can be more than two meters, maximum water level in our lagoon can reach 2,80 m.
Best time for swimming is from August to mid April with high tides during daytime and low tides in the night. Swimming is always possible then. From May until mid July the tides are very low during the day, depending on moon phase and time. Swimming is not always possible then. Click in the title for more information and temperature/rain tables. 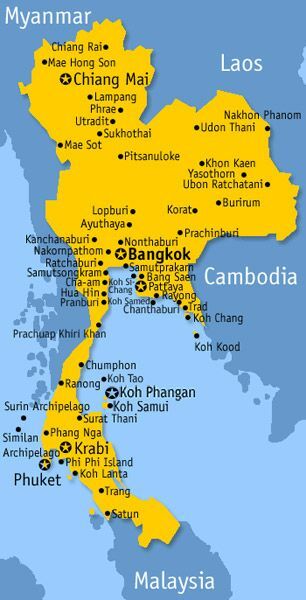 The climate seasons are not the same as in Krabi and Phuket, as these destinations are located in/at the Andaman Sea (West Coast) and Koh Samui, Koh Phangan and Koh Tao are located in the Gulf of Thailand. This makes the climate differences rather evident. The dry season. Not much rain, but it might occur some refreshing wind or breeze at this time. Great for wind and body surfing. It is normally a lot of sunshine at this season. The weather is still dry in this time, and it is usually very sunny and hot. In May it might rain a little more though. This is a great period to visit the islands if you can stand temperatures ranging from 28-35 degrees Celsius at daytime. Also known as the monsoon season. It's still hot and normally there are many sunny days in the monsoon period. On some days you might find yourself in a refreshing monsoon shower for a moment. The rain showers are often short and as these island's water supplies are finite, the rain is needed and important.